Yesterday was a fun day with lots of good accomplishments. In our first two horseshows, Barney and I have qualified for the BLM and Region 1 Championships at second level - not bad. Yesterday's rides were at 3:00 in the afternoon and the temp was in the mid-90s, so I was thrilled to have any horse at all at that point! 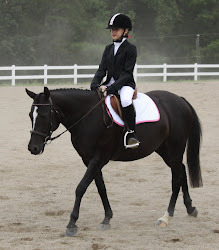 We definitely improved over our last show, with no major errors, and even had some 8's for our medium trot work!! Yesterday also marked the day when I conquered the last of my four worries as a horsewoman that I had mentally listed almost two years ago when our trainer/barn manager, Chelsea, left. I won't bore you with my crazy list of "could I handle that situation?" situations, but I'm pretty happy to have dealt with all of them now and made it to the other side smiling. Of course after watching the videos of my rides, I see so many things I need to really improve as a rider, and I'm dying to get back on and get to work, but I promised Barney he could have the day off - he certainly has earned it (and my house and yard really need the attention)! We're excited to have a long weekend with the kiddos and to be celebrating Bruce's sister's 40th Birthday! Happy Birthday, Sharon, and Happy Labor Day, everyone! We hope you have a great weekend!